One of the reasons that I LOVE running is because of all the lessons I learn through running. Character is tried, tested, and built at every experience level, from novice to elite. I enjoy following racing and interviews with collegiate and elites for some of the same reasons that films such as Hoosiers and Rudy are so popular. I love the process of training and racing in my own running career. But I also I love watching the process as it transpires in others. And there is something very comforting and inspiring about following talented, dedicated, and successful runners through the process. No matter what you are enduring in your running life, whether it is the peak of success or feels like rock bottom, you’re not alone. Someone else is feeling it, living it, enduring it too. Here are some of the basic “lessons” that following the pros can teach you. Lauren Fleshman is very candid about the ups and downs that come with setting big goals and made it to the 5000 meter final at the Olympic Trials after running just three days a week this past winter/spring. Both of these ladies are spokeswomen for courage, fortitude, and mental strength. And their stories, along with the stories of many other ladies, are there when you need them. We all hear that hard work pays off, but in a world of high pressure and even higher expectations, it is easy to forget it. Watching championship meet racing gives you the chance to see proof that dreams come true! 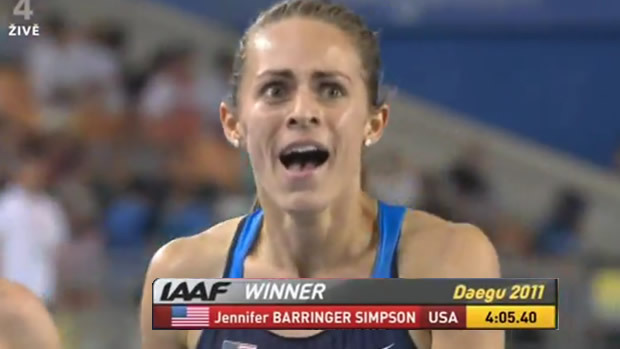 One of the most exciting races to watch from the IAAF 2011 World Championships in Daegu, South Korea was Jenny (Barringer) Simpson sprinting to the line to win the 1500 meter run. At the Columbus Running Company, we have a poster with her twitter feed after the race; “This is what I get for dreaming.” It captures the sentiment of this “lesson” perfectly. Her emotion is proof that the pro’s are people too! She is excited and proud, and it was exciting for fans of the sport to celebrate her success. World champion? She can't believe it! Excitement setting in! Image from http://photoblog.msnbc.msn.com. Remember, your time will come! I’ll be back soon with Part II: a guide the awkward getting-to-know-you stage of fandom. Do you follow the pros? Who inspires you? I love Lauren’s quote too! She is so authentic. Looking forward to the Olympics! I love this post because it outlines how relative running really is. The elites (well, maybe not the ones who’ve had personal coaches, dietitians, etc. for years) go through the same stuff we “hacks” on the local racing circuit do. Almost all their stories demonstrate how non-linear the potential-achieving process is. The common thread is that every single one has had set-backs, but dusted themselves off and got back out there. Can’t wait for Part II! I couldn’t agree more! Runners at all levels can relate to other runners. I passed many hours of winter cross training by watching interviews with and reading articles/blog posts about various professional runners and their comebacks. If they can do it, we can too! This so captures the beauty and reality of our sport. Amazing. I love the video and photos. One of my favorite things is watching elite races (I am the dork that watches the elite marathoners on the computer) and I can’t wait for the Olympics! GO USA! Love the post, and I love being a running “groupie.” Watching the trials this January and knowing almost the entire field by name was quite an experience. From the serious fasties to all those gals we’ve met trying to get there along the way. It was really fun to be rooting for each and every one! I am such a run nerd and little runner groupie! I love the athletes who put it all out there. I follow Fleshman’s blog, as well as Julia Lucas’s, who Kim Conley beat out for 3rd in the 5K. Lots of others are active on Twitter. It makes me think of that feature in Us Weekly – Stars, They’re Just Like Us! So cheesy but so true. The lessons from the pros can be applied at all levels. Oh, and I just wanted to add, Maggie Vessey at the 2009 Prefontaine Classic remains my all-time favorite reaction to a race and to finally accomplishing something you’ve been working so hard towards. I want to run so well that my reaction is on par with hers! Hey Rosemary, Thanks for the mention on your blog. I’m honored. We all inspire one another. Thank God for the old interweb. Thanks for the shout out, Lauren! It’s clear that we at Salty Running are big fans! Thanks for inspiring us with your speed, determination and class.